Sub-section (3) of Section 12 of the Companies Act, 2013 is one of the most non-compliant sub-sections of section 12 if not of the Companies Act, 2013. It may be noticed that most medium and small size companies do not comply with this important provision. 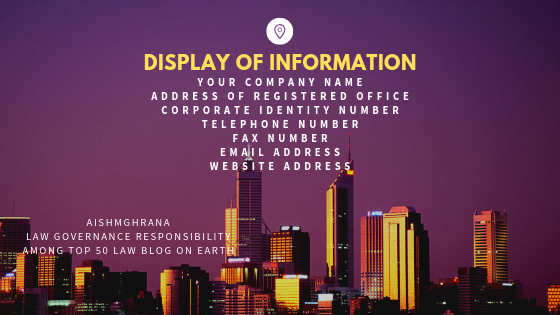 A company shall display its name and other information in accordance with this subsection. This non-compliance may attract penalty up to one lakh rupees. Every company on the outside of every office or place in which its business is carried on in a conspicuous position shall paint or affix its name and the address of its registered office and keep the same painted or affixed. The term “every office and place” include its registered office, corporate office, factories, warehouses, wholesale and retail outlet, manufacturing facilities and other place related to the business of the company. The second part of this requirement deserves careful reading. Where a company has its office at a place where English is not a language of general use, such display of information at that place should be in a language of general use in that locality. The term locality is not defined. In my understanding, locality should be municipal or village limited. Accordingly, where such office is in a locality where the general public uses either of Hindi, Tamil, Mizo or Gaund language, such display of information should also be in these languages. Such display of information in any one of the official language of India or any one of official language the state or official language of the nation where such office is situated may not be sufficient compliance. For example Urdu is one of the official languages of India and also of the state of West Bengal; however, it may not be the language of general use in the district of Darjeeling. This may be noted that the common seal is optional under the Companies Act, 2013 with effect from 29th May 2015. No other documents than mentioned herein has been prescribed by the government yet under the Companies Act, 2013. However, there may be separate requirements under the GST Act and other applicable laws. These details are not within the scope of this discussion. Clause 12(3)(d) may be a relaxation to the provision of clause 12(3)(c). This is an additional requirement for companies having a website for conduction online business or otherwise. the name of the person who may be contacted in case of any queries or grievances on the landing/home page of the said website. where a company has changed its name or names during the last two years, it shall paint or affix or print, as the case may be, along with its name, the former name or names so changed during the last two years as required under clauses (a) and (c). It means old name shall be painted, affixed or printed outside the registered office and every office and documents except hundies, promissory notes, bills of exchange. The words “One Person Company” shall be mentioned in brackets below the name of such company, wherever its name is printed, affixed or engraved. This entry was posted in Chapter II - CA2013, Companies Act 2013 and tagged display of information, Registered Office, Shifting of Registered Office, The Companies (Incorporation) Rules 2014, website of a company. Bookmark the permalink. Any size. Contents should be readable for a naked eye.